Children of eight years of age or older should be able to play happily and safely without direct adult supervision. Older children often like to see the results of their play so manageable projects are a good idea, and they also tend to enjoy being social, so playing with friends may well delight them. Offering a good mix of activities for older children is a must for parents, including activities that parents will join in. Older children have learned the social skills that will keep them safe. They know that sharing is right, they know that they shouldn’t talk to or go off with a stranger, they know that becoming violent with others is wrong and much more. This knowledge means that as older children play there is not an overwhelming concern for their safety, so parents do not need to directly supervise older children at all times. Allowing children to play in the garden while a parent stays in the house, for example, is usually fine with older children. 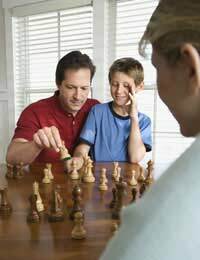 However, parents should consistently check on children aged eight and above as they play, and a sneaky inquiry as to the score of a game will mask the real reason for the visit. Cooking – following a recipe through until a meal is on the table (parents should supervise if children will be working with heat, electricity or sharp objects). Puzzles – working piece by piece until a coherent whole emerges. Sewing or knitting – working with a pattern until something beautiful is made. Reading series books – following favourite characters through a variety of events. Playing board games – following the rules to emerge the winner (or good loser). Inviting children and their friends to the cinema with them. Offering to take children and friends to a water-park or pool. Hosting a video game or board game tournament for children and friends. Take children and friends to a local arcade. Encourage children to host a sleepover for friends. Activities suitable for children aged eight years old and above will differ greatly according to an individual child’s interests and abilities. In general, older children can play well with others and work on manageable projects without direct adult supervision, but only parents will know what is manageable for their own children. By joining in the fun, parents will get to experience their children’s activities for themselves and hopefully have fun while doing it.